Bettie L. Alleman June 10, 1921 - January 13, 2013 Resided in Austintown, OH Funeral services will be 11 am Thursday at Wickliffe Presbyterian Church for Bettie L. Alleman who passed away Sunday afternoon at Briarfield Manor. Bettie was born June 10, 1921 in Youngstown a daughter of the late Robert and Edith (McIlvain) Pool. Bettie graduated with a Bachelor''s Degree in English from Youngstown College and was a member of Wickliffe Presbyterian Church. She was a master gardener and a member of Sweet Adeline and the Mahoning County Square Dance Club. 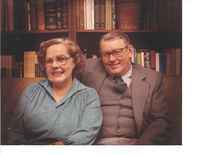 Her husband Edward Alleman whom she married December 11, 1948, passed away January 13, 2008. Bettie will be sadly missed by her three sons: Edward (Ruth Kovac) Alleman Jr of New Castle, PA, Robert (Nancy) Alleman of Austintown and John (Patricia) Alleman of Tampa, FL, two sisters: Suzanne (Jim) Anzellotti-Ray of Poland and Roberta Johnson of Canfield; two sisters in law Glenna Pool of Napoleon, OH and Mary Lou McDowell of West Covina, CA; three grandchildren: Scott (Bethy) Alleman, Breanna Alleman and Chanin Forsyth, and several nieces and nephews. Besides her parents and husband, Bettie is preceded in death by one brother Leroy Pool. Memorial contributions may be made to the church in Bettie''s name. Friends may call from 10 am until 11 am Thursday at the church. Arrangements have been entrusted to Lane Family Funeral Homes Austintown Chapel. Please share your memories of Bettie.